“Trait d’Unions” is an urban project that restores continuity, consistency and aesthetic to a one-kilometre redevelopment of the surface over and along Lausanne’s new M2 metro line. It entailed the creation a new direct pedestrian and bicycle link called the ‘Promenade des Délices’ between the railway station and the lake, as well as several new public spaces ofdifferent scales and environments: two large, generously planted green spaces between the Cour and Elysée neighbourhoods, four urban spaces and small paved squares around the station with benches and bicycle parking. 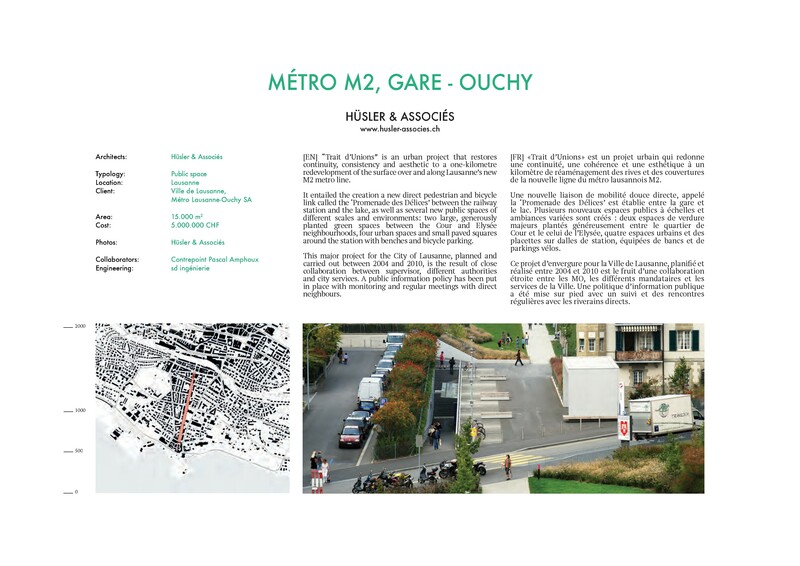 This major project for the City of Lausanne, planned and carried out between 2004 and 2010, is the result of close collaboration between supervisor, different authorities and city services. A public information policy has been put in place with monitoring and regular meetings with direct neighbours.